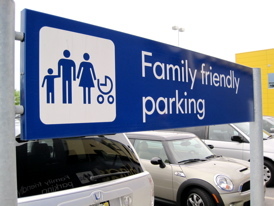 I always wondered why pregnant women were the chosen people in receiving a parking spot close to the entrance. Maybe I was just blessed to have a good pregnancy. But also, pregnant women are encouraged to walk and excercise to ease labor pains, so the parking spot doesn’t make total sense to me. I do understand if you’re pregnant and holding something heavy it would make sense to not have to walk too far, but if you’re pregnant, you would probably be pushing a trolley with your groceries in it anyways. And if you were pregnant, you would probably want to use the parking spot the most in your first trimester when you’re all nauseous, but then you don’t even look pregnant, so you probably wouldn’t want to park there and get weird stares aka dirty looks. Plus, when I was pregnant, all those cool parking spots with the stork sign magically disappeared and reappeared after I was no longer pregnant. A friend told me I’d really need the spot when I had a baby. I didn’t really get it. Now, I do. Whereas the pregnant woman exits her car with just her belly, the new mom exits her car with a heavy, bulky car seat, baby (mood of baby is prone to change), diaper bag (or an overstuffed handbag if you’re like me and are not a fan of diaper bags and want to attempt to look stylish), and possibly even a belly still. I just went to Babies R Us today, and luckily Z was awake when we reached, which means I could remove her from the contraption and not take out the car seat which gets heavier by the day. However, the last time this was the case. What I don’t get about this Babies R Us’s parking lot, there are no trolley slots conveniently located in the parking lot which means you leave the store with your bulky, baby purchases and trolley plus baby (who by now is most probably moody.) Then you put everything in the car, including baby, make a dash back to the store entrance to drop off the baby, I mean trolley, and by now your baby is really ticked off because you’re out of her sight. Alternate option: you could hold baby and run to the entrance to return the trolley, but then you’d have to rebuckle baby in to car seat which is a pain. Today I noticed some moms just left their carts in the parking spots. I know being a good citizen is to return the trolley, but honestly I don’t blame them. I chose to buy less things today so I could just hold the baby and all the purchases. Sorry Babies’R’Us. 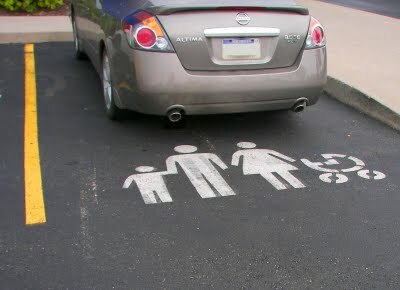 So I would totally give up the pregnant parking spots for some like those below. Thank you IKEA! Previous Stop, Drop, and … Pray! Next Note to Baby: Sometimes you’re not liked! I know the signs appear when you don’t need them! I love your articles, Reem! This one tickled me pink! So grateful for chauffeur driven cars! I have the same free diaper backpack…I do use it sometimes when we’re going out for longer periods of time :). But if it’s a quick trip, I usually stuff my handbag. You’re not a loser. You’re practical :)! LOL I always wondered why pregnant women needed the good spots too! I mean you are pregnant not injured….. but a mommy… well that is different.